DOCTOR WHO SEASON 8 IS HERE! Anyone who had doubts whether Peter Capaldi could embody the Doctor can rest easy. This Doctor is a Doctor in distress. All regenerations result in some sort of post-regenerative crisis. But Capaldi’s is second only to Colin Baker who wins by virtue of having tried to kill Peri. I’m writing this in the immediate aftermath of the episode so, much like our new Doctor, my thoughts are a little scrambled. “Deep Breath” opens great and ends with a truly stunning twist. You’ll get no plot spoilers from me, though. Suffice to say, it was so good, I really want to find one of those leaked scripts now just so I can read the thing and see what did and didn’t change from the page to the screen. I do want to talk about this new 12th doctor though. (Yes, I’m sticking with the original numbering. Hurt is just “the war doctor”, not a number, and meta-crisis Doctor is just…silly.) The word was this new doctor is “darker”. He is certainly not a Tennant-type cocky goofball or a Smith-esque puppy dog, or even a war-torn “fantastic” Eccleston. But I’m undecided as yet whether he’s really “darker”. He’s certainly more alien, way less comfortable in his skin than Tennant’s or Smith’s Doctors, and certainly seems colder. Time will tell if that’s just post-regenerative angst or if this Doctor really is one who will go to darker places. I do get the sense that this doctor, will be simultaneously unable to connect with humans and yet perhaps more dependent on his human companion than ever. One of the podcasts about Doctor Who that I listen to is the Verity Podcast . On an episode last week, one of the panelists pitched the theory that Capaldi’s doctor might be the doctor that Colin Baker’s 6th doctor was intended to be, but never quit achieved. Six was arrogant and intense and alien, but he suffered from weak stories and, yes, a bad costume. Capaldi is reserved, to be sure. I don’t think he’s arrogant, but he can’t relate to people as the other recent doctors could. The show feels different.It doesn’t bounce around in the attention-deficit way previous seasons often have. It takes time with their scenes, holding your attention with the events and dialogue found there, not the music and jump cuts. The opening title sequence is radically different. (Not totally sold on the new arrangement of the theme song though.) The whole show moves at a slightly different pace. Even the incidental music is a bit more subdued. The show is still both family-friendly and, somehow, more grown-up at the same time. Even the Paternoster Gang has taken it down a notch. I’ve always been ambivalent about them. It often feels like they only show up in episodes because some producer somewhere really, really, wants another spinoff now that Torchwood is gone and is pushing this clever, witty trio on us and forcing us to like them. Tonight though, they were funny, but it was a much lighter touch for them. Great as Capaldi is, the real winner in the season opener might be Jenna Coleman’s Clara. Jenna Coleman is a good actress, but I don’t think her character has been served very well since the “soufflé girl” bit and her official debut in The Snowmen. But tonight, it was like the old Clara woke up. She was angry and frightened and defiant and clever and warm and tough. She was what a modern companion should be. Finally. I wasn’t sorry, honestly, about those rumors she’s leaving at the Christmas episode, but I kind of am now. “Deep Breath” opens dinosaur big (literally) and ends with a WTF moment followed by a really ambiguous-I-gotta-tune-next-week-scene. Don’t let me down, Moffat. When I was a kid, I somehow acquired an 8 x 10, autographed photo of Robin Williams and Pam Dawber on the “Mork and Mindy” set. I was a fan of the show. I had a Mork action figure that said “Na-noo, Na-noo” and “shazbot”. And another Mork figure in its own plastic “egg” spaceship. Though young, I knew the show jumped the shark by bringing in Jonathan Winters as Mork’s son, but loved it anyway. I’m still kind of sad I never got rainbow-colored suspenders. As an adolescent, I laughed at his brilliant, but definitely not for kids, standup. I was never, honestly, a rabid fan of his movies, but I was always reliably entertained. Dead Poet’s and Aladdin. Goodnight Vietnam or Moscow on the Hudson. Years came and went, faster all the time, but you could always count on a new movie, or two, from Robin to make you laugh, even while there was a lump in your throat. My favorite Robin Williams performance was his supporting role in Good Will Hunting when he managed to transcend his schmaltzy period – like Patch Adams or A-I – to be truly witty AND moving. I’m watching Popeye, Robin’s second film, as I write this. I LOVED this movie as a kid. True, it’s really not a great movie. The look of the setting and characters is true to the history of the cartoon, and the cast is game, but…yeah, it’s not great. There’s enough there to get a glimmer of the Robin Williams to come; still young, a little uncertain about his on-screen persona, but full of life. In short, he’s all of us in our twenties. For those reasons, it struck me as a fitting way to remember the man and his work this week. I intended to gripe in this post about the destructive power of celebrity and about the the public’ s morbid fascination with celebrity death. But, you know what? I think instead I’m just gonna relax and enjoy a mediocre film with a delightful lead. That’s how tributes are made. Over the weekend, the family and I ascended Mt. Doom and peered into the Eye of Sauron. No, wait! Sorry! What I meant is, the family traveled across our state and halfway through the next one to attend a family wedding. In August in the Midwest, this is a little like ascending Mt. Doom, only hotter. At the end of the wedding, everyone chucks a ring into Mordor, ridding Middle Earth of evil, cake and wedding speeches. This wedding, unlike many family obligations, was a BIG DEAL for my kids because they had jobs, other than sitting still and staying quiet. The boy was a ring bearer and the girl was a flower girl. The daughter, Sophie, dutifully hit her marks and scattered her petals. She’s a trained dancer and handles herself like a pro. But…he is definitely a natural performer. He enjoys the spotlight. I kept waiting for him to yell at the wrong time, wander off the aisle, feed the rings to a passing raccoon. But he didn’t. He took his job seriously and did it well. Good for the wedding…bad for the blog. Charming the ladies. Just like his old man. When the ceremony was over, he even marched down the aisle after everyone cleared out and picked up the petals the daughter had thrown. The only thing that could have made him happier was if we’d let him vacuum. 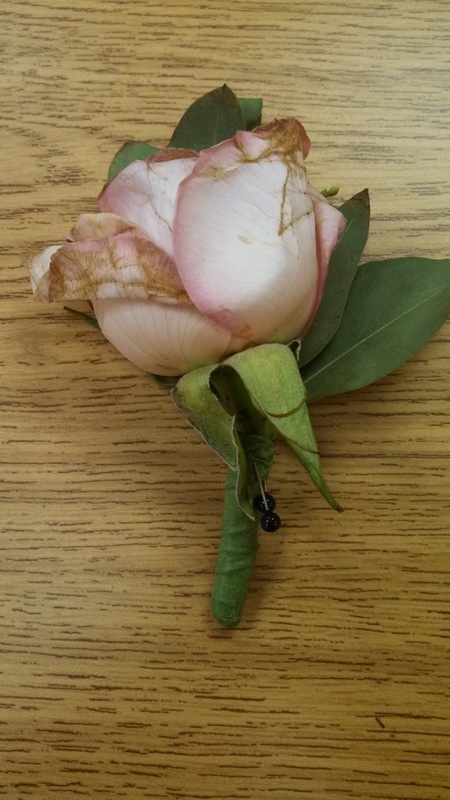 This boutonniere was pristine when the day started. But after countless photos – indoors and out – running around, standing, sitting, posing, marching it needed those stick pins to just hold it together, let alone hold it in place. It was wilted and tired and falling apart. Kind of like the boy’s weary parents. Family weddings are momentous, joyous occasions. Thankfully, they only come around once in a while. Decades ago, the Peanuts comic strip ran a storyline where Snoopy broke his leg tripping over his supper dish, but invented this whole narrative about getting injured saving a group of stewardesses (“flight attendant” wasn’t yet a thing) on runaway horses. Hang on…is group the proper collective noun for flight attendants? I’m thinking “flock” might be better. Anyway, so Snoopy created this flock of flight attendants because, in his own mind, the real story was…what? Not exciting enough? Embarrassing? Just not as fun to tell? Since there is very little in real life that can’t be funneled through the filter of Charlie Brown and the gang, I thought of this while daydreaming in the car on a recent road trip. So here’s the question: why do we lie so much? To ourselves and others? About routine stuff even? I think hero fantasies come from boredom. No matter what we’ve got going on, sometimes our own lives just aren’t that interesting to us. When we tell someone else an anecdote we feel pressure to embellish for fear they’ll think we’re as boring as we do. Why should it be different when we talk to ourselves? Why shouldn’t we want to entertain ourselves as much as we want to entertain others? Who doesn’t have a hero fantasy? Mine involves saving the day – sometimes the whole universe, sometimes just a baby- and includes helicopters and explosions. I don t tell people I’ve actually done this (unless I’m scrounging for free drinks), but the scene unspools on my own little planet where the sky is whatever color I want and I’m always taller than everyone else and don’t have to worry about that extra ten pounds. We all do it. Hero fantasies are like ear wax. We’ve all got some, but we don’t usually share them. So let’s have it. Fantasize about curing cancer? Cool. Daydream about camels, candlelight, and chewy caramels? Bring it on. Living inside an arcade game; riding moose across the Serenghetti (not indigenous, but what the hell? It’s your fantasy. ); or sailing across a sea of sharks while fighting off tanks on pontoons manned by machine-gun wielding alien Amazons. It’s all good. Whatever that little brain-adventure is that makes real life a little more bearable for you, let me know in the comments below.